Although you may battle with what it means to be an adult, we all know that holding onto your black and brass torchiere lamp from college may not be in the best interest of your reputation. You may want to light up your life with something less circa 1985 and a little more circa N-O-W.
Want to part ways with your lighting, but you're on a budget? Give the Nate Berkus line at Linens -n- Things a look or two. Lights from cutie decorator, Nate Berkus, are sure to turn you on. 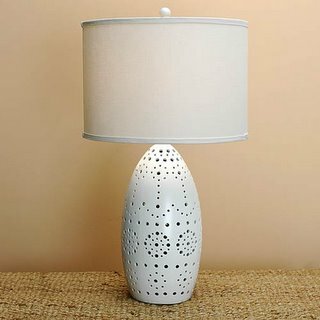 The white pierced ceramic table lamp has my vote for only $69.99, and the seeded glass table lamp for $49.99 ranks a close second. Other Nate Berkus picks (excludes lighting), the link napkin rings (set of 4 $9.99), and the kenya bedding. Time to craigslist that lamp of yours!